Tera Hatfield, a Seattle native, is a design director with a background in visual design and architecture. Her diverse work focuses on the intersection of digital and physical spaces. Jenny Kempson is a multidisciplinary designer with a background in urban design, psychology, and human geography. She continuously explores ways to connect people to places through design. Natalie Ross, a landscape architect with a background in cartography, focuses on the design of urban environments, and works at a Seattle landscape architecture firm. "This 192-page visual treasure trove is a data-driven antidote to the nostalgic woe embodied in #VanishingSeattle and Ghosts of Seattle Past. The trio of authors...bring a wealth of professional talent to this lush and lovely project: urban design, psychology, human geography, cartography, and a zest for the weird and obscure....Readers will gravitate to their own favorites in a book of sheer variety, from the more overtly cultural—a map of ’90s grunge venues or segregation-era Jackson Street jazz haunts—to crowd pleasers like a flavor profile dissection of the gum wall (spoiler alert: it’s mostly spearmint)...I appreciate Seattleness’ desire to step back from the noise and offer something timeless in an ephemeral moment of fever pitched civic churn." "A novel approach and one also suited to the changing city...It belongs on your Seattle bookshelf, eminently browsable, a reference to the random." 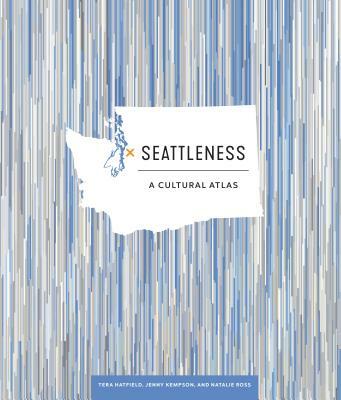 "The new book Seattleness: A Cultural Atlas is an attempt to tell Seattle’s story through data and data visualization...It’s a stunner of a book — large and colorful and incredibly pretty...Even lifelong residents will learn something new about their city here." "Visually rich with infographics, deep-dive data and more than 50 narratives about what makes Seattleites tick, this beautifully illustrated hardcover will delight and educate newcomers and mossbacks alike." "Dives into both the quantifiable and ineffable bits of Seattle, our Seattleness. The three authors, Tera Hatfield, Jenny Kempson and Natalie Ross, synthesized an astonishing amount of data to tell an undeniably human story...Using data visualization, Seattleness crystallizes abstract or complex concepts into beautiful, digestible images."